Avoid water damage from your Air conditioner | Robins Plumbing, Inc.
A/C condensation lines can back up and cause big problems. We aren’t in the air conditioning business so you wouldn’t think we would have a lot to say about air conditioning condensation lines – but we do! 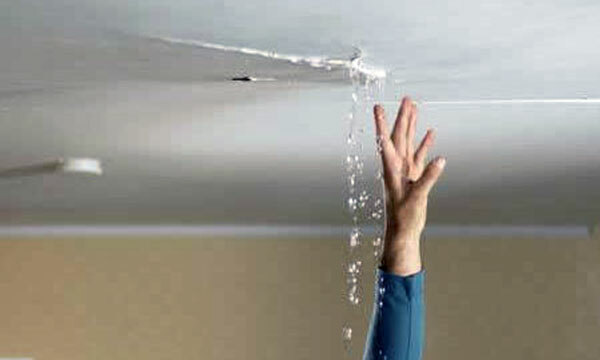 Robins Plumbing is called out frequently for emergencies and once our tech is out there he discovers that the problem isn’t related to the home’s plumbing but rather the air conditioners condensation line is backed up and causing flooding from the ceiling. Excess condensed water is removed from the A/C unit through a small drain pipe, this pipe often connects to a drain line inside the house, very frequently one of the bathroom sinks, they are also tied into the plumbing vent on the roof and sometimes exit on the ground. Over time algae, mold, and mildew can build up inside the condensation drain line and form a clog, causing water to back up and overflow inside the air conditioning unit or where it exits. Many homeowners that have their condensation line tied into their plumbing aren’t aware what it is and when replacing the p-trap underneath the bathroom sink they make the mistake of leaving the condensation line unattached or cap it off all together. This always leads to flooding so if you aren’t sure what something is under your sink ask a professional before ignoring it. As homeowners we tend to only think about things like our condensation lines once they become a problem, but proper maintenance for your condensation line can mean avoiding a flooding disaster in the future. Usually leaks on condensation lines go unnoticed for long periods of time until the problem becomes bad enough that the water actually leaks through the drywall rather than remaining hidden behind it building up mold that can be harmful to you and your home. We recommend that every 6 months when you have your air conditioner maintained that you have the air conditioning tech look at the condensation line. The line should have good slope to ensure the water doesn’t sit in the line and stagnate building up sludge and creating a stoppage. The line should also have as few turns as possible to give the water a clear runway to its exit point. If you’re looking for a reputable and trustworthy air conditioning company please call our office and we will be more than happy to share with you the companies that we have partnered with for your area.